Now the LORD said to Abram, "Go forth from your country, And from your relatives And from your father's house, To the land which I will show you; And I will make you a great nation, And I will bless you, And make your name great; And so you shall be a blessing; And I will bless those who bless you, And the one who curses you I will curse. And in you all the families of the earth shall be blessed" (Genesis 12:1-3). In my new position at Community Bible Church of Omaha, Nebraska, I am teaching Genesis 12 and the call of Abram. Genesis 12:1–3 is a passage I have studied many times over the years, however, recently I have come to realize that the promises in the first three verses of chapter 12 are on the same level as the foundational statements by the Lord in the first eleven chapters of Genesis. This clearly means that one's treatment of Abraham, Isaac, Jacob and their descendants is a major foundational principle for an individual or a nation to consider as one of the responsibilities that God has given to all mankind. I have always believed that there was a blessing or curse waiting for how one treats Israel, but my new realization is that within the structure of Genesis it is placed on the same level as the cultural mandate (Gen. 1:26–28), the establishment of marriage (Gen. 2:18–24), the establishment of civil government after the Flood (Gen. 9:1–8), and the division of the nations after the Flood as an instrument for restraining evil (Gen. 11:1–9). There are three major provisions of the Abrahamic covenant (Genesis 12:1-3). They are summarized as (1) land to Abram and Israel, (2) a seed, and (3) a worldwide blessing. Genesis 12:3 records God's promise to bless those who bless Abraham and his descendants (i.e., Israel). The Abrahamic covenant is directed to Abraham, Isaac, Jacob, and their descendants and focuses on God's promise to give the land of Israel to the Jews. The land promise is repeated to them at least twenty times in Genesis alone (12:1–3, 7–9; 13:14–18; 15:1–18; 17:1–27; 22:15–19; 26:2–6, 24–25; 27:28–29, 38–40; 28:1–4, 10–22; 31:3, 11–13; 32:22–32; 35:9–15; 48:3–4, 10–20; 49:1–28; 50:23–25). 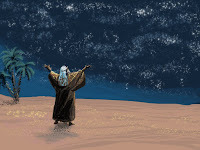 Confirmation of the covenant is given in Genesis 15 when God sealed the treaty through a unique procedure whereby He put Abram into a deep sleep and bound Himself to keep the covenant regardless of Abraham's response. Since God is the only one who swore to keep the covenant, then it is clearly an unconditional covenant dependent solely upon God. Thus, we can be absolutely confident that He will bring to pass every stipulation of the agreement. That the Abrahamic Covenant is a Royal Grant and an unconditional covenant may be seen from an examination of the expressions found in Genesis 26:5 compared with parallel expressions in the ancient near east. Genesis 26:5, a text regarding Abraham's response to his covenant with Yahweh says: "because Abraham obeyed My voice and kept My charge, My commandments, My statutes, and My laws." The term "law" is from the Hebrew torah which means "to direct, teach, or instruct." The verbs of Genesis 26:5 are "obeyed" (similar terminology found at Amarna in covenant contexts), referring to Abraham's obedience to sacrifice Isaac (Gen. 22:1-2), and "kept," where Abraham kept the instruction of Yahweh, paralleling an Assyrian grant where Ashurbanipal rewarded his servant Bulta with a grant because he "kept the charge of my kingship." These verbs indicate a personal relationship rather than a legal code of ethics. Thus, obedience to torah comes from the relationship of covenant. The book of Genesis was written by Moses under the inspiration of the Holy Spirit around 1400 B.C. in conjunction with the Exodus. God's purpose in Genesis is to orient the exodus generation of the nation of Israel to how their people got to their time in history from the perspective of the Lord Himself. This understanding would help to show Israel why they are God's elect nation and their purpose moving forward in the plan of God. In 12:10–20 we see that even when Abram abandons the Lord’s directive to dwell in the Land (the future land of Israel), instead he goes to Egypt and lies about his wife, the Lord blesses Abram and curses Pharoah. What is important to see in the text is that the Lord is working out His promised blessing and cursing based upon His seven decrees, apparently even when Abram is in the wrong ethically. The outworking of God's declarative promises to Abram becomes the thread that is woven throughout, not just the remainder of Genesis, but throughout the rest of the entire Pentateuch (Genesis, Exodus, Leviticus, Numbers, and Deuteronomy). The significance of Genesis 12:1–3 is central to God's plan because it is the literary center and focus of the entire book of Genesis. God's promises to Abram has long been thought to be the foundation for how one should treat Abraham, Isaac, Jacob and their descendants known today as the nation of Israel, but the fact that it is the focus of the book of Genesis strengthens this notion and places it on the same level as one of God's foundational principles by which he runs history. I am not saying anything new or different concerning 12:1–3 that cannot clearly be seen through a normal reading of the text, however, I believe that the Abrahamic promises are strengthened in importance by noting that they are given to all mankind as a foundational principle, on the same level as the cultural mandate (Gen. 1:26–28), the establishment of marriage (Gen. 2:18–24), the establishment of civil government after the Flood (Gen. 9:1–8), and the division of the nations after the Flood as an instrument for restraining evil (Gen. 11:1–9). The divine institutions are conventions that function within the biblical covenants and relate to mankind's social life. I first learned about the biblical teaching relating to divine institutions from a pastor named Charles Clough  about 35 years ago. He says, "Divine institutions are real absolute structures built into man's social existence." "The term 'divine institution' has been used for centuries by Christians, particularly in Reformed circles, to describe the fixed, basic social forms," according to Clough. Divine institutions were created by God (thus divine) but apply to all mankind from the time of Adam and Eve. Man's basic social structures did not just evolve over time but were part of God's creation purposes. The first divine institution is responsible dominion (Gen. 1:26–30; 2:15–17; Ps. 8:3–8), which is the area that an individual is responsible to God. The second divine institution is marriage (Gen. 2:18–24). The third divine institution is built upon the first two and is that of family. The fourth divine institution is civil government whereby God transferred to man through the Noahic Covenant the responsibility to exercise kingdom authority in order to help restrain evil after the Flood (Gen. 9:5–6). The fifth divine institution is tribal diversity, which was also established after the Flood in order to promote social stability in a fallen world (see Gen. 9:25–27 and compare with Gen. 10—11 and Deut. 32:8). "And the LORD said, 'Behold, they are one people, and they all have the same language. And this is what they began to do, and now nothing which they purpose to do will be impossible for them.'" Thus, the only reason why humanity wants to unite itself is in order to more effectively rebel against God, as seen in the Tower of Babel incident. It is within this context that God chose Abram from out of Ur of Chaldeans to be the individual through whom He would start the counter-culture in conflict to the pagan cooperate rebellion against God. Thus, it will be through Israel that God will establish His kingdom, set against and juxtaposed to the kingdom of man that began at Babel. Thus, He establishes the blessing and curses upon those individuals and nations that will bless or curse Abraham, Isaac, Jacob, and their descendants as a foundational principle for governing history. God is indeed a Zionist! Maranatha! To download or listen to Dr. Ice's sermons on the internet go to the following link: http://cbcomaha.org/sermons/. This arrangement was noted by Bruce Waltke in Bruce K. Waltke with Cathi J. Fredricks, Genesis: A Commentary (Grand Rapids: Zondervan, 2001), p. 203. Anyone interested in listening to the mp3 audio series by Charles Clough on "The Biblical Framework" can download for free at www.bibleframework.com. Charles A. Clough, Laying The Foundation , revised (Lubbock. TX: Lubbock Bible Church, 1977), p. 36. An updated version of this can be found in PDF format on www.bibleframework.com. Clough, Laying , p. 36, f.n. 36.